I never dreamed, when I was a little girl, of having something like this in my home when I reflected on being a wife and mother some day! I thought it was so cool when the robotic vacuum came out! But this has simply made my kitchen complete! Have you ever had your hands full and couldn't lift the lid to your kitchen garbage can? Or wonder when someone was going to make a lidded kitchen can that could open/close itself? Or how about one that could deodorize itself so that nasty smells didn't leak out into the whole house? Well, meet iTouchless. This kitchen garbage can is the can of the future! 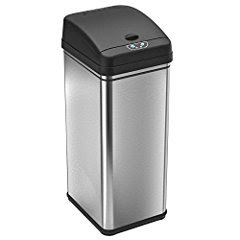 Made with a built in sensor, this can tells itself when you come near it to open the lid, letting you drop the trash in without ever touching the can! You can also use manual, where you touch "OPEN" and "CLOSE" if you want. Or you can simply lift the lid if you choose too. It has two power sources. It will work on 4 batteries, or you can opt to purchase the electrical power supply cord and save on batteries. The stainless steel look is perfect for modern kitchens. Lift the top completely off, and there is a black ring which you will lift out to insert the garbage bag into the can. Then simply put the edges of the bag over the ring, and reinsert the ring. You bag won't even be seen on the outside of the can! And the ring holds it in place, so no more bags sliding down into the can! The inside of the lid has a charcoal filter that is replaceable. This absorbs odors so that they do not filter out from the kitchen can. (I tried putting left over chopped onion in the can. Once in, you couldn't smell it at all! And my house is small. Usually, onion smell lasts for days!) Love it! The lightweight can is perfect for your kitchen or home. It holds a 13 or 18 gallon garbage bag. I use the 13-gallon size so that I'm not tempted to overload! Overloading will lead to the lid not being able to close properly and could damage it. So that is the only caveat that I can think of. You can purchase this little wonder HERE. It retails for $59.96, and will ship for free. I give this product five stars. I give it a BIG thumbs up! And I give my personal recommendation. ****DISCLAIMER: This product was provided by Amazon Vine in exchange for a fair and impartial review. All opinions on this product as above are solely those of this blog's author.